Super fun!!! 100% worth the time and money. Special thanks to our guide Ha Kim!!! Take a break from the hustle and bustle of Seoul's concrete jungle and go on a wonderful trip to the Gyeonggi province to learn about the history and culture of South Korea. Your first stop will be the quaint and humble Minsok Korean Folk Village, where you can admire the incredible architecture and get a glimpse of traditional life in the country. Here, you'll get the opportunity to experience culture by wearing traditional Korean outfits and by participating in a wide variety of folk activities. 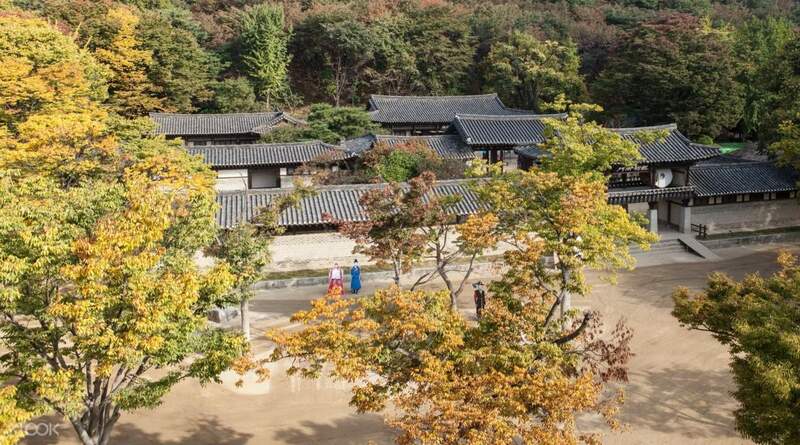 If you're a fan of K-Dramas, then you'll have a wonderful time roaming around the village because it's used as a filming location for acclaimed titles like "Dae Jang Geum" and "My Love from the Stars." If you availed the package that includes a ride on the Uiwang Rail Bike, you'll travel to the city of Uiwang and hop on the famous rail bike. It'll take you on a breathtaking, filmic ride around the gorgeous Wangsong Lake and through a beautiful flower tunnel. You'll be able to revel in the tranquil atmosphere of nature as you go around on the rail bike. The last stop of this trip is the Gwangmyeong Cave, an incredible theme park that was built inside a mine where gold and other minerals were. 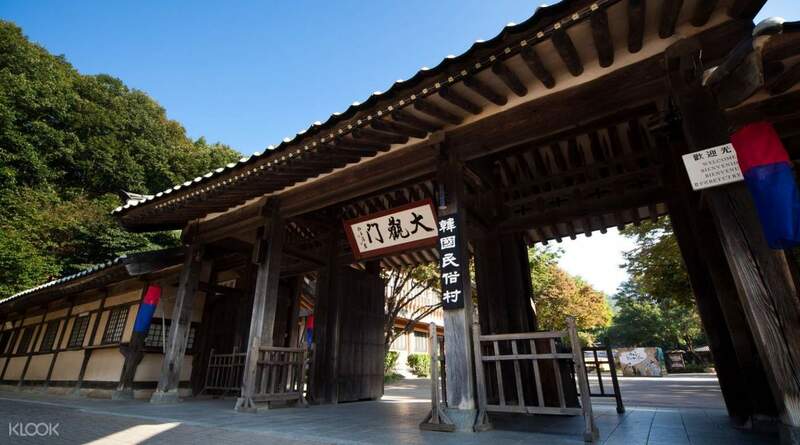 There are numerous activities and exhibitions inside it; you'll definitely learn a lot about the country by visiting each section. This trip is a must for history buffs and nature lovers looking to go sightseeing beyond Seoul. This is the best tour we had this trip. It's really a unique experience and would teach you about korean history and culture. It would take total of 2 to 3 hours roundtrip but it's worth it! Van used for the tour was very comfortable. Tour guide was very approachable and gave good recommendations. This is the best tour we had this trip. It's really a unique experience and would teach you about korean history and culture. It would take total of 2 to 3 hours roundtrip but it's worth it! Van used for the tour was very comfortable. Tour guide was very approachable and gave good recommendations. The ride to Minsok Korean Folk Village is smooth. The weather's not ao nice but it still push through.. The Guide, Ms. Sunny was very accomodating too. Thank you for that. It will be awesome if the weather's nice. but nonetheless, I liked it! The ride to Minsok Korean Folk Village is smooth. The weather's not ao nice but it still push through.. The Guide, Ms. Sunny was very accomodating too. Thank you for that. It will be awesome if the weather's nice. but nonetheless, I liked it! finn and olivia was our tour guide. Their communication skill is well. Both of them can speak in english and chinese. so far tour was very convinient. we are only 5persons in a car. uiwang railbike is advisable. its not cold even winter. as they got cover. only few people come here..this is better than the gangchon railbike as lesser people. korean folk village is a must. this place is for learning korean history. how it looks like these kinds...its all in one there. also dont forget to watch their shows. the starlight garden oozoo. its very stunning at night. good for couples and family. can take a lot of photo there.. overall..very good experience. finn and olivia was our tour guide. Their communication skill is well. Both of them can speak in english and chinese. so far tour was very convinient. we are only 5persons in a car. uiwang railbike is advisable. its not cold even winter. as they got cover. only few people come here..this is better than the gangchon railbike as lesser people. korean folk village is a must. this place is for learning korean history. how it looks like these kinds...its all in one there. also dont forget to watch their shows. the starlight garden oozoo. its very stunning at night. good for couples and family. can take a lot of photo there.. overall..very good experience. Our tourist guide Mr. Song and his colleagues are very organized. Everything was smooth sailing from start to finish. I love how he shared important details of Korean culture and history. My partner and I enjoyed this tour as we learned alot about Korean culture and way of life back in the day. Visiting Minsok Korean village is a must! The shows/performances were amusing and entertaining. The place is well kept, and they got great authentic Korean food. Kudos to Klook and Ktour story! Our tourist guide Mr. Song and his colleagues are very organized. Everything was smooth sailing from start to finish. I love how he shared important details of Korean culture and history. My partner and I enjoyed this tour as we learned alot about Korean culture and way of life back in the day. Visiting Minsok Korean village is a must! The shows/performances were amusing and entertaining. The place is well kept, and they got great authentic Korean food. Kudos to Klook and Ktour story! Hassle free tour to a less crowded part of Seoul. Minsok Village was interesting, though language of the performances were spoken in korea, the performance were interesting. Uiwang Rail Bike was nice but definitely can't compare to Gangchon's. Highlight of the tour was definitely Gwangmyeong Cave where is was cooling inside with a wine cellar. However part of the cave is not accessible to wheelchair. Hassle free tour to a less crowded part of Seoul. Minsok Village was interesting, though language of the performances were spoken in korea, the performance were interesting. Uiwang Rail Bike was nice but definitely can't compare to Gangchon's. Highlight of the tour was definitely Gwangmyeong Cave where is was cooling inside with a wine cellar. However part of the cave is not accessible to wheelchair. Thank you Klook for excellent experience. Our tour guide Song and his manager was awesome, friendly, able to speak good English and handsome 🙂. Value for money, less crowded than Nami island, highly recommend to everyone. 1. Korean Folk Village: absolutely love this village because it reproduces almost intact image of an ancient Korean, very peaceful and fresh, vegetable gardens, ancient trees with colorful leaves ... included performances like farmer’s music, martial art on horseback, traditional wedding ceremony. 2. 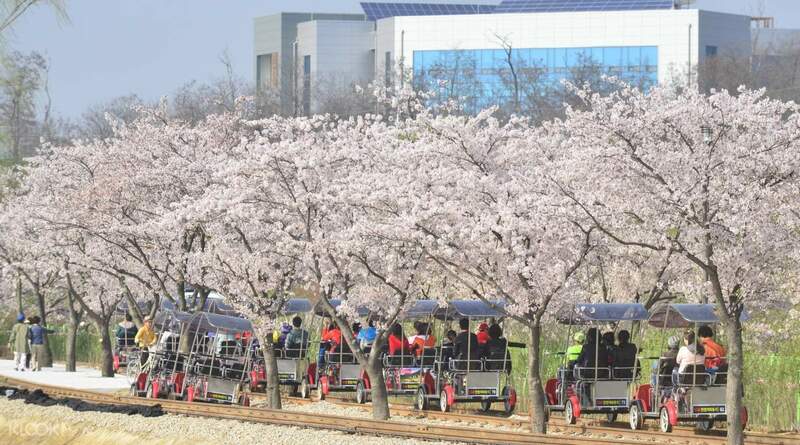 Uiwang Rail Bike: fun rail bike experience along Wangsong lake. 3. Gwangmyeong Cave: Amazing light shows c/w aquarium inside, also can make a wish of 'Long Life, Happiness and Peace' on a gold plaque and hang it on the wall of the golden road. There are many steps and stairs to climb up and down, so if you have weak knees, be careful. Thank you Klook for excellent experience. Our tour guide Song and his manager was awesome, friendly, able to speak good English and handsome 🙂. Value for money, less crowded than Nami island, highly recommend to everyone. 1. Korean Folk Village: absolutely love this village because it reproduces almost intact image of an ancient Korean, very peaceful and fresh, vegetable gardens, ancient trees with colorful leaves ... included performances like farmer’s music, martial art on horseback, traditional wedding ceremony. 2. Uiwang Rail Bike: fun rail bike experience along Wangsong lake. 3. Gwangmyeong Cave: Amazing light shows c/w aquarium inside, also can make a wish of 'Long Life, Happiness and Peace' on a gold plaque and hang it on the wall of the golden road. There are many steps and stairs to climb up and down, so if you have weak knees, be careful. Very organized tour and love the places we visited. The meeting point in Myeongdong was very easy to locate. Our guide Ryan was awesome, very friendly and able to speak good English. I enjoyed the rail bike a lot and was able to enjoy the scenary. It was a good experience. Korean Folk Village is a great place for Kdrama lovers because many historical dramas were filmed there. Was delighted to see many familiar spots! Don't miss the performances at the village. 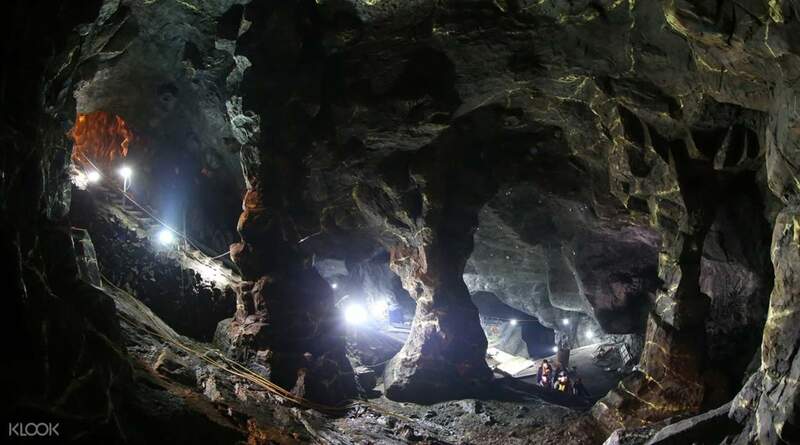 Gwangmyeong Cave is one of the newer attractions offered in Korea. It was nice walking in the cave and you can enjoy a glass of wine in the wine bar located within the cave. I managed to purchase a bottle of berry wine( bokjunja) for only 18,000 won. Delicious and taste like ice wine. Well organized tour, punctual and value for money. Very organized tour and love the places we visited. The meeting point in Myeongdong was very easy to locate. Our guide Ryan was awesome, very friendly and able to speak good English. I enjoyed the rail bike a lot and was able to enjoy the scenary. It was a good experience. Korean Folk Village is a great place for Kdrama lovers because many historical dramas were filmed there. Was delighted to see many familiar spots! Don't miss the performances at the village. Gwangmyeong Cave is one of the newer attractions offered in Korea. It was nice walking in the cave and you can enjoy a glass of wine in the wine bar located within the cave. I managed to purchase a bottle of berry wine( bokjunja) for only 18,000 won. Delicious and taste like ice wine. Well organized tour, punctual and value for money.